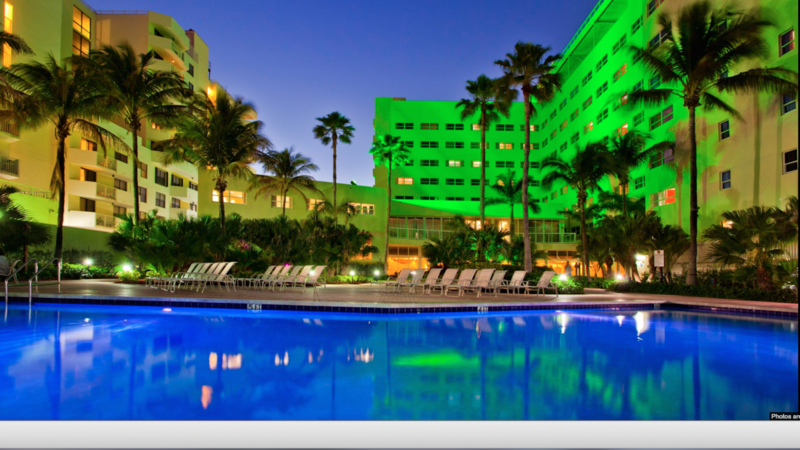 Rent Holiday Inn Miami Beach - Oceanfront | Corporate Events | Wedding Locations, Event Spaces and Party Venues. Eleven miles east of Miami International Airport, our Miami Beach hotel is located where I-195 meets A1A at the Atlantic Ocean. Our hotel in Miami Beach offers you an unparalleled location, with the Atlantic Ocean's sandy beaches as our backyard. Business travelers staying at our Miami Beach hotel can host a business meeting in our large meeting rooms that seat up to 240 guests. Meeting planners can take advantage of the hotel's A/V equipment and catering menus to accommodate their meeting needs. Families will find it easy to get to Miami's museums and attractions, as many are within 15 miles of our hotel. Business guests appreciate the close proximity of our hotel to the Miami Beach Convention Center, two miles away. Our Miami Beach accommodations are within 10 miles of Sony, Mt. Sinai Hospital and the University of Miami. The free wireless Internet access will help you stay in touch while you travel.